Although it was countless hardware and years of experience that made possible the almost permanent presence of Russian cosmonauts in space, the Progress cargo ship stands out as perhaps the single biggest contribution into this achievement. 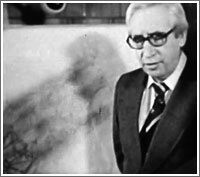 Very early in the development of space stations, Soviet designers realized that long-duration missions in Earth orbit would demand a constant supply of consumable materials from Earth. 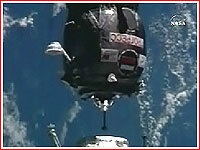 Attempts to employ the Soyuz spacecraft for this purpose did not solve the problem. 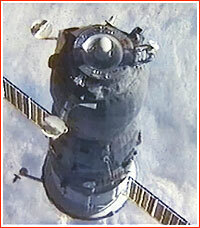 The issue became especially apparent during development of the Salyut-6 space station in the mid-1970s. TsKBEM (now RKK Energia), the developer of the Salyut space stations, considered different configurations of a Soyuz-derived ship adapted for cargo missions. Designers studied different sizes, as well as manned and unmanned versions of the craft. The concept of an unmanned ship ultimately won, eliminating the possibility of returning cargo from space. NPO Energia hoped to address the "return" issue later, with the introduction of the special retrievable capsule, now known as Raduga, which would be incorporated into the spacecraft. Materials and supplies for the station crews would be placed into a pressurized section of the craft which loosely resembled the habitable module of the Soyuz. The docking port equipped with a hatch would allow the station crew to load and unload the spacecraft in a pressurized environment. 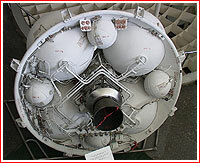 The reentry or descent module of the Soyuz, however was replaced with an unpressurized propellant and refueling compartment. This way, when docked to the station, the poisonous propellants would be stored safely outside the pressurized compartments and any leaks of gaseous supplies would have no effect on the station's atmosphere. After docking, the propellant tanks of the station and refueling tanks onboard the cargo ship would be linked up through a sophisticated refueling system. 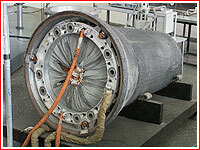 As in Soyuz, the propulsion and service systems were installed in the tail section of the vehicle. Unlike Soyuz, the cargo ship was inseparable during its entire flight and upon conclusion of its supply mission to the station would be directed into the atmosphere to burn up. TsKBEM officially started development of the cargo ship, designated 11F615A15, in mid-1973 and completed the preliminary design in February 1974. Ironically, the head of TsKBEM, Vasiliy Mishin, who opposed the involvement of his organization into the space station project at the expense of an ill-fated lunar effort, naturally did not support the cargo ship development. (Mishin believed that TsKBM led by Vladimir Chelomei, which pioneered space station development in the USSR, should lead the program, while his collective should concentrate on a lunar effort.) By the end of 1973, however, S.A Afanasiev, the head of MOM, overruled Mishin. The government officially authorized the project in 1974. The vehicle was developed within the Salyut-6 project. In 1986, as the Mir space station started operating in orbit, its developer NPO Energia conducted a modernization of the Progress spacecraft, limited primarily to its flight control systems. The preliminary design for the new version of the vehicle was completed in May 1986. The first Progress M cargo ship was launched in August 1989 toward the Mir space station. A Progress vehicle during pre-launch processing, as seen through the adapter ring, which will connect it to its rocket. This so-called "propellant" modification of the spacecraft was developed specifically for the International Space Station. 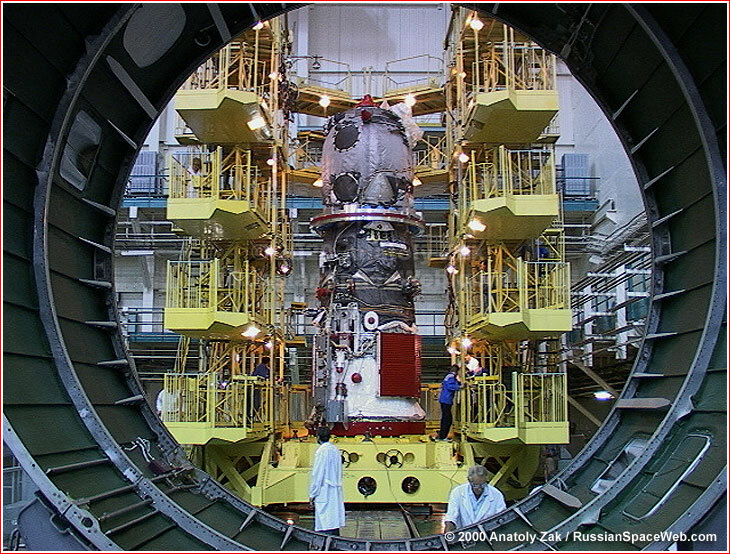 RKK Energia "repackaged" the middle (refueling) section of the spacecraft to allow the delivery of more fuel to the ISS. Additional propellant tanks were squeezed into the middle section at the expense of the water tanks, which were moved into the front "cargo" section of the craft. 12 tanks with a nitrogen and oxygen mix for the station atmosphere were placed on the exterior of the craft around the "neck" between the cargo and propellant modules (see photos on this page). A new digital flight control system was also introduced along with the Kurs-MM rendezvous and docking system, which replaced a previous version of Kurs. The first M1 version of the Progress was launched on February 1, 2000 toward the Mir space station. On August 6, 2000, the first Progress spacecraft (M1-3) was launched toward the ISS. Starting during the 1980s, NPO Energia was developing a new, heavier modification of the Progress spacecraft with an elongated cargo module. The vehicle would be delivered in space by the Zenit launcher, capable of lifting up to 10 - 13 tons into low Earth orbit. The original plans expected Zenit/Progress M launches from Plesetsk into the high-inclination (62 degrees toward the Equator) orbits intended for the Mir-2 space station. 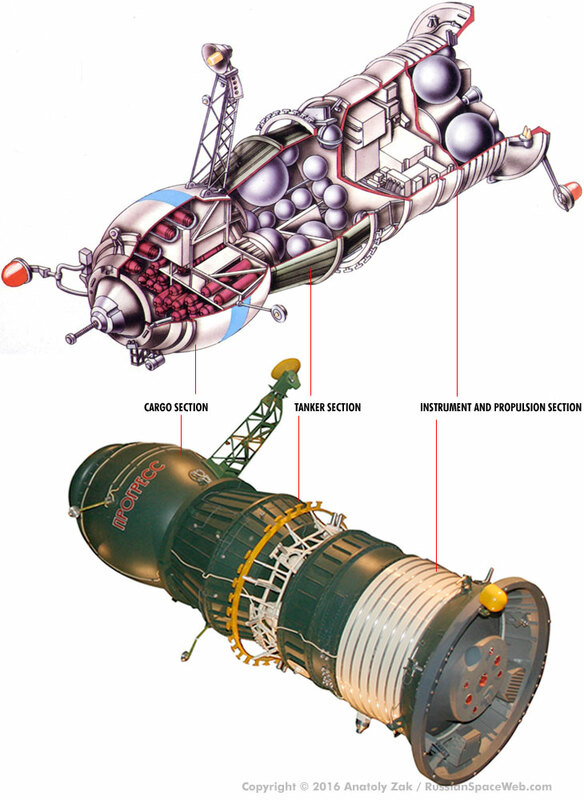 The disintegration of the USSR essentially killed the plans to use Zenit as a launch vehicle for the Russian manned space program, since production of the rocket ended up in the newly independent Ukraine. Later, RKK Energia planned to use the Progress M2 for resupply of the International Space Station, however, again political and financial problems stalled the project for years. At the end of the 1990s, as the Russian-Ukrainian relationship somewhat stabilized, RKK Energia tried to revive Progress M2-based modules. Published designs of the Enterprise module (see illustration) and possible future Russian-Ukrainian modules for the ISS, might use the hardware developed for the Progress M2 project. First introduced in 2008, Progress M-M sported a modern TsVN-101 digital flight control system, replacing the obsolete Argon-16 computer which controlled previous ships. Also onboard was the new miniaturized MBITS radio-telemetry system. These upgrades enabled faster and more efficient flight control system, while at the same time, reducing the overall mass of avionics onboard the ship by 75 kilograms and the number of avionics modules by 15. First launched on Dec. 21, 2015, the Progress MS version featured an upgraded Kurs-A rendezvous system designated Kurs-NA and a number of other new systems. On Aug. 7, 2017, Roskosmos announced that flight testing of the Progress MS series had been successfully completed with a signing of a special decree earlier that month, Roskosmos said. The testing of the MS series was conducted during launches of Progress MS and Progress MS-02 vehicle and concluding with the mission of Progress MS-03 as the final certification flight. In August 2016, RKK Energia completed the new design of a cargo ship, then known as TGK PG, which would take full advantage of the payload capacity of the Soyuz-2-1b rocket, delivering around 8.2 tons to the low Earth orbit or nearly a ton more than the mass of the Progress cargo ship series launched on previous versions of the Soyuz rockets. Launches toward ISS. Progress M with TsVN-101 instead of the Argon-16 computer; A miniaturized MBITS radio-telemetry system is introduced. Progress M1 with TsVN-101 instead of Argon-16? 2001 Jan. 24: The Progress M1-5 spacecraft carrying 2,677 kilograms of propellant for Mir's deorbiting maneuvers launched from Site 1 in Baikonur Cosmodrome at 07:28:42 Moscow Time (11:28 p.m. EST on January 23). 2001 Feb. 26, 11:09:35 Moscow Time: The Progress M-44 (Tail number 244) was launched toward the ISS. 2001 May 21, 04:32 Baikonur Time: A Soyuz-FG rocket with a modified injection system ("forsunochnaya golovka") on the engines of the first and second stage, delivered the Progress M1-6 cargo ship on its way to the International Space Station, ISS. 2001 Aug. 21: A Soyuz rocket launched the Progress M-45 toward the ISS; (earlier expected in June and July). The cargo ship docked at the station on August 23, 2001. 2001 Sept. 15, 03:35 Moscow Time: A Soyuz rocket successfully launched the Docking Compartment toward the ISS. 2001 Nov. 26, 21:24 Moscow Time: A Soyuz-FG rocket launched the Progress M1-7 cargo ship toward the ISS. The mission was delayed from Nov. 14, 2001. The cargo ship separated from the ISS on March 19, 2002 at 20:43 Moscow Time. On March 20, 2002, at 1:28 a.m. Moscow Time, a 20.5-kilogram, prism-shaped Kolibri-2000 satellite was jettisoned from the Progress M1-7. The satellite was expected to function in orbit between four and six months according to different estimates, and it would be used by Russian and Australian students. To make room for the arrival of the next cargo ship, the Progress M1-7 spacecraft undocked from the station on March 19, 2002, at 20:43 Moscow Time. The Progress M1-7 then fired its maneuvering engine and reentered the atmosphere with its surviving debris hitting the ocean surface on March 20, 2002, around 05:21 Moscow Time. 2002 March 21: The Progress M1-8 cargo ship blasted off from Baikonur Cosmdorome on Thursday, March 21, 2002, at 23:13 Moscow Time, heading toward the International Space Station, ISS. To make room for the new arrival, Progress M1-8, undocked from the aft docking port of the Zvezda service module on June 23, 2002. The Progress M1-8 then fired its maneuvering engine to reenter the Earth atmosphere. 2002 June 26: The Progress M-46 cargo ship blasted off from Site 1 at Baikonur Cosmodrome on Wednesday, June 26, 09:36 Moscow Time, heading toward the International Space Station, ISS. After a three-day flight, The Progress M-46 was expected to dock to the ISS on June 29, 2002. The launch of Progress M-46 had previously been scheduled for mid-April and May 14, 2002. The Progress M-46 successfully docked to the aft port of the Zvezda service module of the ISS on June 29, at 06:23 GMT. To make room for the new arrival, Progress M-46, undocked from the aft docking port of the Zvezda Service Module at 8:59 a.m. CDT (13:59 GMT) on Wednesday, Sept. 24, 2002. 2002 Sept. 25: The Progress M1-9 cargo ship blasted off from Site 1 at Baikonur Cosmodrome on Thursday, Sept. 25, 20:58 Moscow Time, heading toward the International Space Station, ISS. After a four-day flight, the Progress M1-9 was expected to dock to the ISS. The launch of the Progress M1-9 had previously been scheduled for the end of June and July 20, 2002. The Progress M1-9 undocked from the ISS and was deorbited on February 1, 2003. 2003 Feb. 2: As NASA mourned the fallen crew of the Space Shuttle Columbia, tragically lost on Feb. 1, 2003, Russia launched a cargo ship to resupply the crew of the International Space Station. The Progress M-47 cargo ship lifted off from Baikonur Cosmodrome's Site 1 on February 2 at 15:59:40 Moscow Time. The cargo ship was scheduled to dock with the ISS on February 4, 2003, at 17:50 Moscow Time. The Progress M-47 mission had previously been planned for Oct. 6, 2002 and Jan. 30, 2003. The Progress M-47 successfully docked to the ISS on February 4, 2003, at 17:49 Moscow Time. 2003 June 8: Russia launched a cargo ship to resupply the crew of the International Space Station, ISS. The Progress M1-10, No. 259 cargo ship blasted off from Baikonur Cosmodrome's Site 1 on June 8, 2003, at 16:34 local time (10:34 GMT). The spacecraft was carrying several tons of supplies to the station, including water, which became the most precious commodity onboard the outpost, after the Shuttle fleet was grounded by the Columbia accident on February 1, 2003. Unlike usual practice, Russia scheduled to leave the previous cargo ship, Progress M-47, docked to the station, as the fresh transport arrived. The new configuration would allow using the capabilities of two cargo vehicles in maintaining the station. The launch of the Progress M1-10 was previously scheduled for March 28 and May 26, 2003. 2003 Aug. 29: Russia successfully launched a cargo ship to resupply the crew of the International Space Station. The Progress M-48, No. 248 cargo ship blasted off from Baikonur Cosmodrome's Site 1 on August 29, 2003 at 5:47:59 Moscow Summer Time. In preparation for the new arrival, a previous transport craft, the Progress M-47, left the aft docking port of the Zvezda service module of the ISS on August 27, 2003, and was later deorbited. 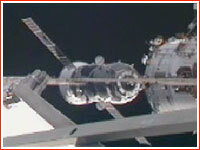 The Progress M-48 docked to the ISS as planned on August 31, 2003 at 07:45 Moscow Time. In the meantime, the Progress M1-10, which had arrived to the station in June 2003, was scheduled to undock from the station's Pirs Docking Compartment on September 4, 2003, making it available for the arrival of the Soyuz TMA-3 spacecraft in October 2003. The scheduled launch date for the Progress M-48 mission slipped from July 5, and July 30, 2003, and then it was advanced from Sept. 18, 2003. In preparation for the arrival of Progress M1-11, the Progress M-48 left the the ISS on January 28, 2004, and was deorbited the same day. 2004 Jan. 29: A Soyuz-U rocket successfully launched a cargo ship to resupply the crew of the International Space Station. The Progress M1-11, No. 260, cargo ship (Mission 13P) blasted off from Baikonur Cosmodrome's Site 1 on January 29, 2004 at 14:58:08 Moscow Time. The launch of Progress M1-11 had previously been expected on Nov. 11, Nov. 18 and in December 2003. The Progress M1-11 undocked from the ISS on May 24, 2004 at 13:19:29 Moscow Time. The vehicle was expected to remain in orbit for around 10 days for the attitude control system tests, mission control in Korolev said. 2004 May 25: The Progress M-49, No. 249, cargo ship (Mission 14P) blasted off from Baikonur Cosmodrome's Site 1 on May 25, 2004 at 16:34:23 Moscow Time. 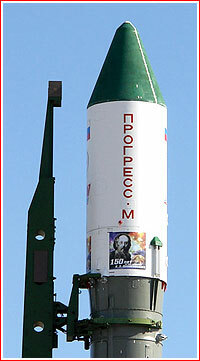 The launch of Progress M-49 had previously been scheduled for Jan. 30, March 25 and May 19, 2004. The Progress M-49 docked to the ISS as planned on May 27, 2004 at 17:55 Moscow Time, mission control in Korolev said. 2004 Aug. 11: Russia successfully launched a cargo ship to resupply the crew of the International Space Station. The Progress M-50, No. 350, cargo ship (ISS mission 15P) blasted off from Baikonur Cosmodrome's Site 1 on Aug. 11, 2004 at 09:03:07 Moscow Time. 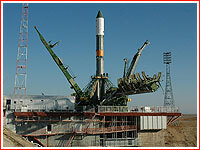 The launch of Progress M-50 had previously been planned for June 20 and July 28, 2004. The Progress M-50 docked to the rear docking port of the service module of the ISS on Aug. 14, 2004 at 09:01:08 Moscow Time, just two minutes earlier than scheduled. To make way for the arrival of the Progress M-51, the Progress M-50, was commanded to undock from the station at 22:37 Moscow Time on December 22, 2004. After separation, the station crew was expected to use a Fialka UV camera to document exhaust from the ship's thrusters and their influence on the exterior of the station. Russian mission control initiated the deorbiting burn at 01:32 Moscow Time on December 23, 2004 and remnants of the vehicle were expected to impact in remote area of the Pacific Ocean at 02:24 on the same day. Along with more than a ton of trash and disposable items, on its way down, the Progress M-50 carried the Orlan spacesuit No. 12, whose service life has expired. 2004 Dec. 24: A Russian cargo ship is heading to the International Space Station, ISS, carrying critically needed food rations among 2.5 tons of supplies. A Soyuz-U rocket with the Progress M-51 No. 351 (ISS mission 16P) blasted off from Site-1 in Baikonur Cosmodrome at 01:19:31 Moscow Time on December 24, 2004. The vehicle successfully reached its initial orbit nine minutes later. The Progress M-51 was scheduled to dock to the aft docking port of the Zvezda service module of the ISS at 03:31 Moscow Time on December 26, 2004. Along with 65 containers of Russian and American food, enough for 112 days onboard, the cargo ship was carrying Christmas presents for the crew, propellant, water and a German mechanical arm dubbed Rockviss. The device was scheduled for installation on the exterior of the station at the end of January 2005. Food supplies had been running low onboard the station in the previous several weeks, prompting mission control officials to ask the crew to reduce their daily rations until the arrival of the Progress M-51. Failure of the cargo ship to reach the station would have required the evacuation of the crew. The Progress M-51 mission was delayed from Nov. 24, 2004. In November 2004, it was delayed for 24 hours from Dec. 23 to adjust for an orbit correction error, during the Progress M-50 engine firing on Nov. 17, 2004, which had left the station in an orbit 2.7 kilometers lower than expected). The Progress M-51 undocked from the ISS on February 27, 2005, at 19:07 Moscow Time. The spacecraft was expected to remain in orbit for around 10 days for tests. It was safely deorbited on March 9, 2005. The braking engine firing was initiated at 19:17 Moscow Time, sending the vehicle toward the routine impact area over the Pacific at 40 degrees South latitude off Christmas Island. The debris were expected to impact around 20:03 Moscow Time. 2005 Feb. 28: The Soyuz-U rocket with the Progress M-52 No. 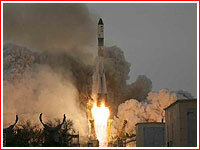 352 (ISS mission 17P) blasted off from Site-1 in Baikonur Cosmodrome at 22:09 Moscow Time on February 28, 2005. The vehicle successfully reached its initial orbit nine minutes later. After a two-day flight, the Progress M-52 automatically docked to the aft port of the Zvezda service module of the ISS on March 2, 2005, at 20:10 GMT, as the two spacecraft flew over the equator off of the west coast of Africa. Among the regular 2,100 kilograms of supplies, the Progress M-52 delivered food, fuel, oxygen, air and water. The unique cargo included cameras and lenses that would be used to photograph the thermal protection tiles of Space Shuttle Discovery as the Return to Flight mission was approaching in May or June 2005, as well as flight control avionics for the European ATV cargo ship. The craft was also carrying 50 snails for life-science experiments, aimed at better understanding of vestibular system. 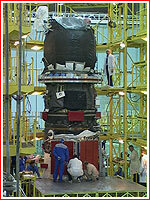 The Progress M-52 separated from the station at 00:16 Moscow Time on June 16, 2005. Its braking engine was fired at 03:16 Moscow Time and its remnants were expected to impact in the remote region of the Pacific Ocean at 04:02 on the same day. 2005 June 17: The Soyuz-U No. 94 rocket with the Progress M-53 No. 353 (ISS mission 18P) blasted off from Site-1 in Baikonur Cosmodrome at 03:09 Moscow Time on June 17, 2005. The vehicle successfully reached its initial orbit and separated from the third stage of the launch vehicle at 03:18 Moscow Time. After a two-day flight, the Progress M-53 docked to the ISS on June 19, 2005, at 04:40 Moscow Time. 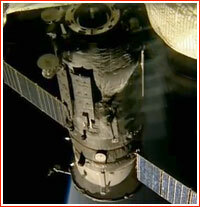 Due to loss of power at a ground control station in Shelkovo, East of Moscow, the spacecraft was docked to the station under manual control, by Sergei Krikalev onboard the station. The Progress M-53, was undocked from the station on Sept. 7, 2005, at 14:25:57 Moscow Time (10:25:57 GMT) and its engine was fired at 17:26:00 Moscow (13:26:00 GMT) for 167 seconds, directing the spacecraft to burn up in the Earth's atmosphere. Its remaining debris were expected to impact a remote area of the Pacific Ocean some 5,700 kilometers east of New Zealand at 18:12:40 Moscow Time (14:12:40 GMT). On its way from the station, the spacecraft was carrying more than one ton of trash and used equipment, including a failed Electron oxygen-generating unit, which had been replaced earlier. 2005 Sept. 8: The Soyuz-U No. 95 rocket with the Progress M-54 No. 354 (ISS mission 19P) blasted off from Site-1 in Baikonur Cosmodrome at 17:07:54 Moscow Time (13:07:54 GMT) on Sept. 8, 2005. The vehicle successfully reached its initial orbit and separated from the third stage of the launch vehicle 529 seconds after launch. 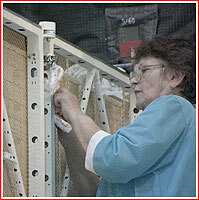 Among the cargo carrier's more than 2.6 tons of cargo is a new liquids unit for the Russian Elektron oxygen generator. The unit has been out of operation since late May. The launch had been previously scheduled for August 24, 2005. After a two-day flight, the Progress M-54 docked to the aft docking port of the Zvezda service module of the ISS on Sept. 10, 2005, at 18:42 Moscow Time, seven minutes ahead of the previously announced time. 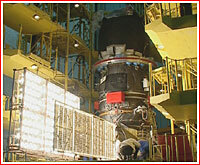 The spacecraft had been scheduled to depart the station in December 2005, prior to the arrival of a fresh Progress, however the decision was made to keep the vehicle at the aft port of the service module until March 3, 2006, while the Progress M-55 would dock to the Pirs Docking Compartment on the Russian segment of the station. 2005 Dec. 21: A Soyuz-U rocket with the Progress M-55 No. 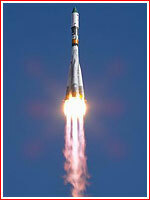 355 (ISS mission 20P) blasted off from Site-1 in Baikonur Cosmodrome at 21:39 Moscow Time. The vehicle successfully reached its initial orbit and separated from the third stage of the launch vehicle at 21:47 Moscow Time on the same day. Among the ship's more than two tons of cargo were Christmas presents for the crew. After a two-day flight, the Progress M-55 successfully docked to the Pirs Docking Compartment of the ISS on Dec. 23, 2005, at 22:54 Moscow Time (1954 GMT), eight minutes ahead of schedule. The Progress M-55 was undocked from the ISS on June 19, 2006, at 18:06:50 Moscow Time. The reentry burn was scheduled for 21:06 Moscow Time and the remnants of vehicle were to impact in the Southern Pacific at 21:53 Moscow Time. 2006 April 24: A Soyuz-U rocket with the Progress M-56 (ISS mission 21P) blasted off from Site-1 in Baikonur Cosmodrome at 20:03:25 Moscow Time (16:03:25 GMT) on April 24, 2006. After a two-day flight, the Progress M-56 successfully docked to the aft port of the Zvezda service module of the ISS on April 26, 2006, at 21:41:31 Moscow Time. Along with a regular supply of consumables, Progress M-56 delivered golf gear, which Pavel Vinogradov from the Expedition 13 would use for a commercial advertising campaign during an upcoming spacewalk. The Progress M-56 launch had previously been scheduled for April 16, 2006. The vehicle was undocked from the aft docking port of the Zvezda service module of the ISS on September 19, 2006, at 04:28 Moscow Time. The braking maneuver was initiated at 07:28 Moscow Time and its debris were expected to hit Pacific ocean at 40.42" South latitude and 225.18" East longitude. 2006 June 24: A Soyuz-U rocket, carrying the Progress M-57 spacecraft, blasted off from Baikonur Cosmodrome's Site 1 at 19:08:18 Moscow Time. The vehicle reached the orbit at 19:17 Moscow Time. The 7,290-kilogram spacecraft was scheduled to dock to the ISS on June 26, 2006, at 20:43 Moscow Time, plus/minus three minutes. The Progress carried a total of 2,578 kilograms of cargo, according to mission control in Korolev. The launch had been targeted for June 28, 2006, in previous revisions of the space station launch manifest. 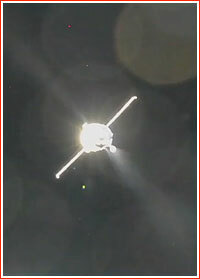 The Progress M-57 was undocked from the Pirs Docking Compartment of the ISS on January 17, 2007, at 02:32 Moscow Time, to make way for the upcoming mission of the Progress M-59 spacecraft. The same day, at 05:29 Moscow Time, the cargo ship initiated braking maneuver to reenter the atmosphere. Its debris were expected to impact the ocean at 06:15:20 Moscow Time, some 4,200 kilometers east of Wellington, New Zealand. 2006 October 23: The Progress M-58 (No. 358) spacecraft blasted off from Baikonur Cosmodrome's Site 1, at 17:40:36 Moscow Time (13:40:36 GMT). The Soyuz-U (No. 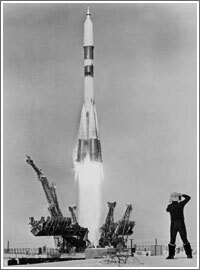 102) rocket followed a standard trajectory to reach an orbit with an inclination of 56.1 degrees toward the Equator. A Russian cargo ship arrived at the International Space Station, ISS, Thursday, October 26, 2006, however Russian flight controllers delayed the completion of the docking process, while they tried to find out the status of a docking antenna which had apparently failed to retract fully. The orientation antenna, known as 4AO-VKA, should retract in order to avoid hitting elements of the aft docking compartment of the service module on the ISS, where the cargo ships dock. 2007 Jan. 18: Russia launched its first space mission of 2007, sending a 7,290-kilogram cargo ship toward the International Space Station, ISS. The Soyuz U rocket carrying the Progress M-59 spacecraft lifted off from Site-1 in Baikonur Cosmodrome on January 18, 2007, at 05:12:13 Moscow Time (02:12 GMT; 09:12 p.m. EST on Jan 17). The vehicle carried 1,390 kilograms of cargo, including 266 kilograms of food in containers and fresh fruits, according to the representative of mission control in Korolev, Russia. It also carried 870 kilograms of propellant, oxygen and air and 317 kilograms of cargo for the US segment of the station. The mission also honored the 100th anniversary of the birth of Sergei Korolev, carrying his portrait on the payload fairing. The launch had previously been scheduled for Dec. 20, 2006. To make way for the new vehicle, the old Progress M-57 was undocked from the Pirs Docking Compartment of the ISS on January 17, 2007, at 02:32 Moscow Time. The same day, at 05:29 Moscow Time, the cargo ship initiated braking maneuver to reenter the atmosphere. Its debris were expected to impact the ocean at 06:15:20 Moscow Time, some 4,200 kilometers east of Wellington, New Zealand. The Progress M-59 successfully docked to the Docking Compartment of the ISS on January 20, 2007, at 05:58:53 Moscow Time (02:58:53 GMT), four minutes ahead of schedule. To make a room for the arrival of the Progress M-61, the Progress M-59 cargo ship undocked from the ISS on Aug. 1, 2007 at 18:07:05 Moscow Time. Upon a command from the Russian mission control, the vehicle fired its braking engine at 22:42 Moscow Time. It then reentered the Earth's atmosphere and its debris impacted a remote region of the Pacific Ocean some 5,000 kilometers east of Wellington, New Zealand, on the same day around 23:27 Moscow Time. 2007 May 12: An unmanned cargo ship successfully blasted off from the Russian launch site in Kazakhstan, carrying supplies for the International Space Station, ISS. A Soyuz U rocket, carrying the 7,290-kilogram Progress M-60 cargo ship, lifted off from Cosmodrome Baikonur's Site 1 on May 12, 2007, at 07:25:38 Moscow Time (03:25 GMT). The launch vehicle followed a standard trajectory to reach a 193 by 245-kilometer orbit, with an inclination of 51.6 degrees toward the Equator. The Russian space agency, Roskosmos, said the spacecraft successfully separated from the upper stage of its launch vehicle, an event which had been scheduled to take place at 07:34:25 Moscow Time. After a three-day chase and five orbit corrections, the Progress M-60 docked as scheduled to the aft docking port of the Zvezda service module on the International Space Station, on May 15, 2007, at 09:10 Moscow Time. The Progress M-60 was carrying a total of 2,561 kilograms of supplies, including water, air, propellant, food, life-support supplies for the crew and hardware for the station's systems. The launch of Progress M-60 had originally been scheduled for Feb. 7, 2007. On Sept. 19, 2007, at 04:37 Moscow Time, Progress M-60 separated from the aft docking port of the service module and then remained in free flight until Sept. 25, 2007. While the cargo ship remained in the autonomous flight, ground tracking equipment was used to observe its engine firings in plasma studies. 2007 Aug. 2: A Soyuz-U rocket, carrying the Progress M-61 cargo ship, blasted off from Baikonur Cosmodrome's Site 1 on Aug. 2, 2007 at 21:33:48 Moscow Time. The launch followed a standard trajectory, delivering a 7,270-kilogram spacecraft into a 268 by 191-kilometer orbit with an inclination of 51.64 degrees toward the Equator, according to mission control in Korolev, Russia. After a three-day flight, Progress M-61 docked to the station's Pirs Docking Compartment, on Aug. 5, 2007, at 22:40 Moscow Time. The succesful arrival of the Russian Progress cleared the way for the launch of the Space Shuttle Endeavour on Aug. 8, 2007. The Russian cargo ship delivered around 2.5 tons of supplies to the orbital outpost, as the two vehicles flew over Central Europe. The launch of Progress M-61 was delayed from May 12, 2007, and then advanced from Sept. 3 to Aug. 16, 2006. In the wake of computer problems onboard the ISS in mid-June 2007, officials considered advancing the launch date as far as July 23, 2007. To clear way for the Progress M-62, the Progress M-61 was undocked from the station on Dec. 22, 2007, at 06:59:52 Moscow Time (03:59:52 GMT). The vehicle was expected to remain in orbit for about a month, for a series of "technical experiments," mission control said. It was deorbited on Jan. 22, 2008. 2007 Dec. 23: A Soyuz-U rocket, carrying the Progress M-62 cargo ship, blasted off from Baikonur Cosmodrome's Site 1 on Dec. 23, 2007, at 10:12:41 Moscow Time. The launch followed a standard trajectory, delivering the 7,270-kilogram spacecraft into a 252 by 194-kilometer orbit with the inclination 51.64 degrees toward the Equator, according to mission control in Korolev, Russia. The vehicle carried around two and half tons of propellants, air, scientific equipment and other supplies for the crew of the station. Progress M-62 docked to the Pirs docking compartment of the station on Dec. 26, 2007, at 11:14:06 Moscow Time, or 12 minutes ahead of previously announced time. The launch of Progress M-62 was previously scheduled for Aug. 1, Nov. 15 and Dec. 12, 2007. The Progress M-62 was undocked from the ISS on Feb. 4, 2008 and remained in orbit for a series of observations of the plasma caused by its thrusters, using ground-based radar of the Solar-Earth Physics Institute of the Russian Academy of Sciences in the city of Irkutsk. The Plasma-Progress experiment was commissioned by TsNIIMash research institute of Korolev. 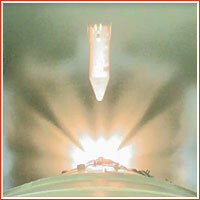 The spacecraft was deorbited on Feb. 15, 2008 with a braking engine firing starting at 12:44:00 Moscow Time (09:44 GMT). Its remnants were scheduled to impact the Pacific Ocean at 43°58' South latitude and 142°32' West longitude at 13:29:34 Moscow Time (10:29:34 GMT). 2008 Feb. 5: A Russian cargo ship blasted off toward the International Space Station, ISS, ahead of a critical Shuttle mission to deliver the European laboratory module to the orbital outpost. A Soyuz-U rocket, carrying the Progress M-63 cargo ship, lifted off from Baikonur Cosmodrome's Site 1 on Feb. 5, 2008, at 16:02:57 Moscow Time. The launch followed a standard trajectory, delivering the 7,270-kilogram spacecraft into a 263 by 191-kilometer orbit with an inclination of 51.63 degrees toward the Equator, according to mission control in Korolev, Russia. The vehicle carried around two and half tons of propellants, air, scientific equipment and other supplies for the crew of the station. Progress M-63 was scheduled to dock to the station on Feb. 7, 2008, at 17:38 Moscow Time (14:38 GMT). The mission was delayed from Aug. 1, 2007 and Jan. 29, 2008 and then advanced from Feb. 12, 2008. On Jan. 10, 2008, in coordination with NASA, the launch was further advanced from Feb. 7 to Feb. 5, 2008, to enable the launch of the Space Shuttle Atlantis on Feb. 7, 2008. To make way for the arrival of the Soyuz TMA-12 spacecraft, Progress M-63 was undocked from the Pirs docking compartment on April 7, 2008, at 12:49:42 Moscow Time (08:49:42 GMT). The deorbiting burn was initiated at 15:50 Moscow Time and the splash down of the remaining debris of the vehicle in the Pacific Ocean was estimated at 16:36 Moscow Time (12:36 GMT), Russian space agency said. 2008 May 15: A Russian cargo ship blasted off toward the International Space Station, ISS, carrying supplies for the Expedition 17 crew. A Soyuz-U rocket, carrying the Progress M-64 cargo ship, (No. 364) lifted off from Baikonur Cosmodrome's Site 1 on May 15, 2008, at 00:22:56 Moscow Time, Roskosmos said. The undocking of Progress M-64 took place on Sept. 1, 2008 at 23:46:39 Moscow Time. The vehicle then remained in orbit for several days to enable its observations within the Plasma-Progress experiments. The deorbiting maneuver was initiated on Sept. 9, 2008 at 00:47:00 Moscow Time (GMT: Sept. 8 at 20:47:00). The surviving debris of the ship were expected to hit Pacific Ocean at 42º06' South latitude and 138º36' West longitude on Sept. 9, 2008, around 01:33:19 Moscow Time (GMT: Sept 8, 21:33:19). 2008 Sept. 10: A Russian cargo ship blasted off toward the International Space Station, ISS, carrying supplies for the Expedition 17 crew. A Soyuz-U rocket, carrying the Progress M-65 cargo ship, (No. 365) lifted off from Baikonur Cosmodrome's Site 1 on Sept 10, 2008, at 23:50 Moscow Time, Roskosmos said. According to a previous schedule, the launch of the Progress cargo ship had been planned for July 2008. The docking of the ship with the station was scheduled for September 13, 2008 at 01:01 Moscow Time, however due to a hurricane approaching mission control facilities in Houston, the decision was announced on September 11 to delay the docking until September 17, 2008. 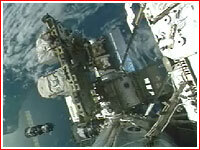 The spacecraft reached the aft port of the Zvezda service module on at 22:43:08 Moscow Time (18:43:08 GMT). Progress M-65 undocked from ISS on Nov. 15, 2008, at 19:19:54 Moscow Time (16:19:54 GMT). The spacecraft was remained in orbit for several weeks for a series of "geophysical studies," mission control in Korolev said. A 142-second braking maneuver was initiated on Dec. 8, 2008, at 11:02:00 Moscow Time (08:02:00 GMT) sending the ship toward the reentry and impact at 41 degrees 19 minutes South latitude, and 135 degrees 39 minutes West longitude. The impact was expected to take place around 11:48:47 Moscow Time (08:48:47 GMT). 2008 Nov. 26: The Progress M-01M mission. 2009 Feb. 10: The first mission of 2009 to the International Space Station heralding a full-crew occupation of the outpost within few months, took off from steppes of Kazakhstan. A Soyuz-U rocket carrying the Progress M-66 cargo ship lifted off from Site 31 in Baikonur Cosmodrome on Feb. 10, 2009, at 08:49:46 Moscow Time (05:49:46 GMT). Progress M-66 carried more than 2,400 kilograms of cargo including fuel, water, food, a new space suit and other hardware. After a nine-minute powered flight, the launch vehicle released the cargo ship into a 192.54 by 249.55-kilometer orbit with an inclination of 51.63 degrees toward the Equator at 08:58:33 Moscow Time. Progress M-66 docked to the station's Pirs Docking Compartment as planned on Feb. 13, 2009, at 10:18:13 Moscow Time (07:18 GMT). It was the first of five cargo vehicles scheduled to fly during 2009 to re-supply the station crew, which is expected to double from three two six during 2009. To handle new traffic from Baikonur, launch pad No. 6 at Site 31, which was primarily used for commercial and science missions, was brought back to support manned space program. The Progress M-66 undocked from the ISS on May 7, 2009, at 19:18 Moscow Time (15:18 GMT). The vehicle remained in orbit for a new series of observations in a Plasma-Progress experiment planned by TsNIIMash research institute aimed to determine properties of plasma forming around the ship during the firing of its engines. On May 18, 2009, at 18:28:30 Moscow Time, Progress M-66 initiated a braking maneuver, sending the spacecraft toward reentry in the Pacific Ocean at 42º34' South latitude and 139º24' West longitude. Surviving debris were expected to hit the ocean surface at 19:14:45 Moscow Time. 2009 May 7: The Progress M-02M mission. 2009 July 24: Russia launched a mission to resupply the International Space Station. A Soyuz rocket carrying the Progress M-67 cargo ship lifted off from Baikonur Cosmodrome on July 24, 2009, at 14:56:56 Moscow Time. The mission carried more than 2,549 kilograms of supplies to the ISS. The docking with the outpost was planned for July 29, 2009, at 15:16 Moscow Time (11:16 GMT). An unusually long rendezvous period (five instead of standard two days) was caused by a scheduling conflict with the STS-127 mission of the Shuttle Endeavour, which was continuously delayed from June 2009, but ultimately was scheduled to leave the station only on July 28, 2009. With the Shuttle safely away from station, the Progress M-67 successfully reached the aft port of the Zvezda service module, on July 29, 2009, at 15:12 Moscow Time. However last dozens of meters in the rendezvous, the cargo ship had to be flown under manual control of the station's Expedition 20 commander Gennady Padalka, rather than in a nominal automated mode. This mission was previously planned for launch on June 24, 2009. The Progress M-67 spacecraft was undocked from the ISS on Sept. 21, 2009, and deorbited on Sept. 27, 2009. Leading engineer at NPO Energia Konstantin Feoktistov presents the design of Progress spacecraft. Progress-1 lifts off on Jan. 20, 1978. Progress cargo ship approaches Mir circa 1997. A payload fairing of the Progress M-61 cargo ship carried a poster commemorating the 150 anniversary of Konstantin Tsiolkovsky's birth.